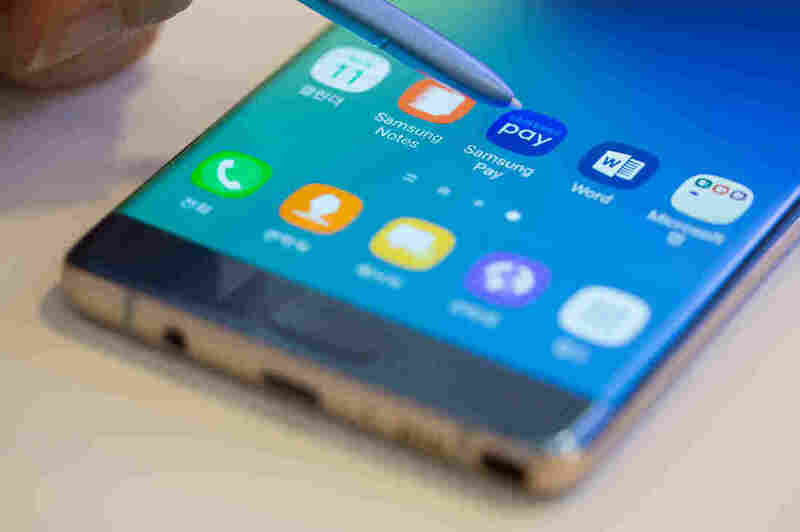 1M Samsung Galaxy Note 7 Phones Recalled By Consumer Product Safety Commission : The Two-Way Chairman Elliot Kaye said consumers should "take advantage of this recall right away" because the phone represents such a "serious fire hazard." An employee demonstrates Samsung Electronics Co.'s Samsung Pay application on a Galaxy Note 7 smartphone with stylus. The Consumer Product Safety Commission issued a formal recall of 1 million Samsung Galaxy Note 7 smartphones on Thursday. During a press conference, Chairman Elliot Kaye said consumers should "take advantage of this recall right away" because the phone represents such a "serious fire hazard." Kaye said consumers should check the identifying number on the back of the phone at Samsung.com to determine whether their phone has a defective battery. If the phone is included in the recall, which almost all phones sold in the U.S. are, customers can take the phone back to Samsung directly or to their carrier to receive a refund or a replacement phone. "That is a choice of the customer and customer's choice alone," Kaye said. Our friends at the All Tech Considered blog reported that some customers were having problems taking their phones back. Kaye said that now that the Consumer Product Safety Commission is involved, the recall procedure should be more streamlined. The Galaxy Note 7, which is waterproof, with a curved display and a stylus, was supposed to rival Apple's new iPhone. But, as All Tech reported, the release was marred by several dozen "reports that the phones overheated and flared up, particularly while being charged." According to the CPSC, Samsung has received 92 reports of batteries overheating in the U.S., "including 26 reports of burns and 55 reports of property damage, including fires in cars and a garage." The agency is advising affected consumers to power down their phones and return them to wherever they bought them.